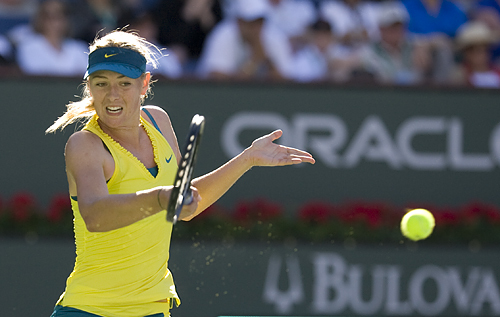 Maria made strides in 2011 but now must take a leap. Maria Sharapova’s 2011 season can be seen in a variety of ways, one of which is that it was a major stepping stone back toward the top levels of the game; and another that clearly indicated that she has decent sized strides to take before she can consistently challenge the other elite players. It was major year of transition for Sharapova: not only did she announce in the off season that she had become engaged to basketball player Sasha Vujacic (clearly a huge positive personally because she wanted stability), but at the start of the year she switched coaches from her longtime friend Michael Joyce to Swede Thomas Hogstedt, which for a while did take an emotional toll on her, and perhaps explains her below par performance at the Aussie Open. At first, she looked on confused court but gradually, by the spring, when she better understood how Hogstedt wanted her to attack, she began to look more comfortable. The major positives that came out of her season started in Miami, where she reached the final; continued through the clay court season when she won her first major title on crushed brick in Rome; went on in Paris where reached the semis of Roland Garros; then continued though Wimbledon ,where she stung one opponent after another and reached the final. But other than her revival in Miami and a title run in Cincinatti, the rest of the season on hard courts was not up to her pre 2009 standards, given that she is a former Australian Open and US Open titlist. She played arguably the worst match of her Grand Slam career in going down to Andre Petkovic in Australia and was seriously disappointed in the way she performed in the third set of her third round defeat to Flavia Pennetta at the US Open. Her fall was not noteworthy as she badly sprained her ankle in Tokyo and pulled out of the WTA Championships after two matches, and ended the year ranked No. 4. What Sharapova can also be pleased about is that she scored big wins over Gen Caro members Wozniacki, Azarenka, Radwanska, Cibulkova and Lisicki. She also bested some veteran Russians, but did take tough losses to Pennetta, Petkovic (whom she did beat twice later in the season) Na Li, Serena and yes, for the first time, Sam Stosur.